“Trinity” was shot in Berlin in 2016 with established performers Lina and Parker welcoming newcomer Rooster. This is the short film version of their scene. Inside the member’s area you’ll also find the extended, semi real-time version of the scene which went on for over two hours. During that marathon, Lina had several orgasms including one so emotional that she cried tears of joy. 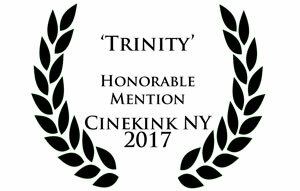 “Trinity” has since won several awards at film festivals. You can see the short film and full extended scene inside the member’s area of Bright Desire. Plus director’s commentary, an interview with Lina, Parker and Rooster and more screenshots and photos.